How long has it been since you’ve enjoyed a quick parents trip without the chicos? It had been nearly a year since our last and that one lasted 24 hours! Many of our amigos have visited the EPCOT Food & Wine Festival but I had only briefly visited on my own last year and Daddy Chris had not been there at all. So this year we decided that a ‘Parents Weekend’ was just the right fit for our crazy schedule and it was well worth it! The tasting menus from around the world are a fun way to try new flavors. The great thing about Orlando is that it’s fairly easily accessible via car or plane so we headed up for the 3.5-hour trip from Miami. 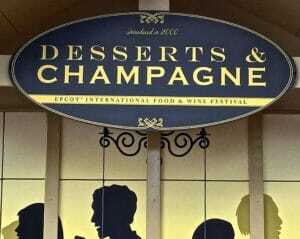 You must book any type of dining or even lunch experience in the many EPCOT restaurants in advance of your arrival as I didn’t realize the amazing popularity of this event! 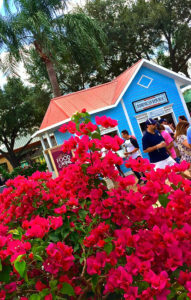 The more than 30 added food kiosks make it a worldly experience. Since we booked our dining reservation the same week, we didn’t have too many choices. But what we did enjoy was the ‘Eat to the Beat’ Package that includes your dining reservation and a guaranteed fairly close-up seat at one of the weekly concerts held at the American Pavilion during the festival. We enjoyed a fun dinner at the German ‘Biergarten’ and unknowingly booked for 80’s music star Tiffany and had so much fun hearing several classic eighties songs and her own popular hit including ‘I Think We’re Alone Now’ (try getting that out of your head now!). At the Japan kiosk try the ‘Frozen Beer’ which has a frothy top and keeps your beverage cold in the hot Florida sun. The true star of the festival is simply walking around World Showcase and enjoying the many ‘pop up’ kiosks that only are open during the festival. From Poland to Argentina to the Dominican Republic – there is a small tasting menu available at more than 30 ‘country marketplaces’ and each one has several wine and beer options as well. It is surely an adults’ paradise. There is music, tons of food, unique shows, culinary demonstrations and wine and spirits education workshops that are featured. 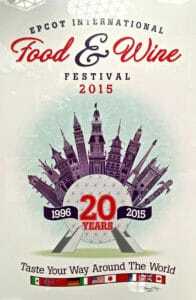 And surprisingly 2015 is the festival’s 20th anniversary! My top tip is to hurry and make it before November 16th and try planning for a weekday visit. The festival was packed on the Saturday we attended and there are less event opportunities. Wednesday thru Fridays are better days and even Sunday is another good choice when looking at the scheduling. Do your research before you call the Disney Reservation line and look carefully through the online Festival information. Know the name of the events that interest you so they can best guide you on the availability. Be open to a new experience. Perhaps you really wanted to experience the special beer tasting at the Japan pavilion but only dining at Germany or Morrocco are available. Try it! The whole concept behind the festival is getting out of your comfort zone and ‘trying’ something new. That’s why the tasting menus are a perfect portion. Book a hotel on the Disney property and use the Disney transportation system. Given the higher amount of alcoholic beverages you’re likely to consume, an on-site property has never been more important! This way you automatically have a ‘designated driver’ and everyone can enjoy their own experience. Be ready to have fun. Whether you go with your significant other or a group of friends, I’ve never seen so many people having so much fun! Adults are in general good spirits while at Disney. We made several new friends at every pavilion as people are talking about what they’re trying next. 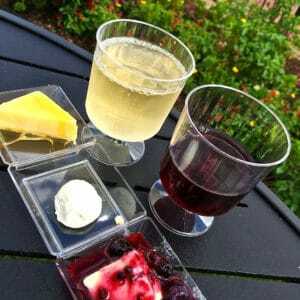 For full dining reservations and information, check out the Disney site and then call 407. 939-5277. 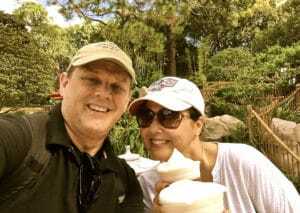 This entry was posted in Travel and tagged couples getaway, Disney, EPCOT, Fall travel, parents, travel. Bookmark the permalink.